Mistake #1: Not learning from mistakes. My biggest mistake was not learning quickly from mistakes. I chose persistence over reflection. Reflect on relationships. Move quickly toward failing relationships to see if they might be strengthened. Protect people from themselves. Success gives leaders permission to ignore or make excuses for their frailties. Strengths have fatal flaws. Suppose you’re a talented organizer, for example. Too much organization is stagnation. Ask yourself, “What if I’m wrong,” when you think others are wrong. Boldness without openness is stubbornness. Mistake #2: Not learning from success. Success teaches you what to repeat, just be sure you’re repeating the right things. Breakthroughs happen when you change something. But, after a breakthrough, you mistakenly think that doing the same thing over and over will result in more breakthroughs. Others are contributing more to your success than you’d like to believe. How much of your success is about good fortune? You were in the right place at the right time, for example. What does joy caused by success tell you about yourself? Mistake #3: Focusing on problems more than solutions. 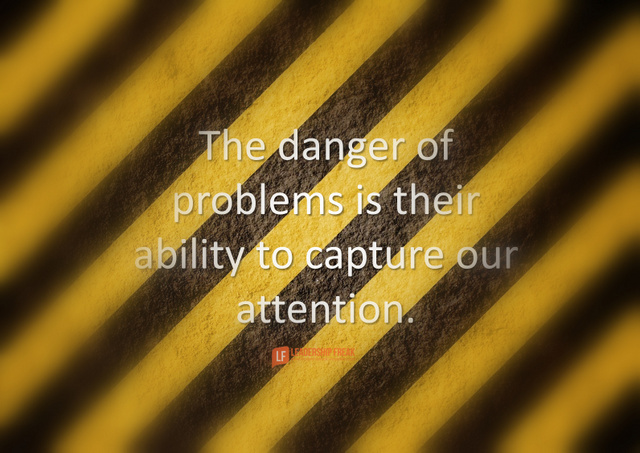 The danger of problems is their ability to capture our attention. Lousy leaders solve problems. Successful leaders pursue solutions. Problems are useful when they help you clarify what you want. “Don’t-want” leadership de-energizes. You’ve already lost when you forget why you’re hacking away in the weeds. Point to the big picture, when teams get lost in the weeds. Mistake #4: Allowing someone’s inabilities to overshadow their abilities. Weaknesses have corresponding strengths. Tolerance is essential, if you want to leverage someone else’s strengths. The thing that drives you crazy about someone may be their genius. It’s desirable for others to be different from you. What are some big leadership blunders? Thanks Don. I appreciate the input. Thanks for always knowing exactly what I need to hear! What are some big leadership blunders? Doing the mistake again is a sign of poor judgement. What have you learned from mistakes? Don’t do it again, may cost you customers, relationships, careers depending on the severity. Thanks Dr. Cheng. Best for the journey. Whew. This list is a summary of most people’s work environments with suggestions of how one might approach his or her situations. Thanks for the well thought out advice. Here’s what caught my eye first: “My biggest mistake was not learning quickly from mistakes. I chose persistence over reflection.” Not learning from mistakes routinely makes the options ‘usable success or failure.’ If we learn from those mistakes, the options are reduced to only one: usable success – first attempt (unlikely) or after learning from one or more attempts that included learning from mistakes. Boldness without openness is stubbornness!!! and boom goes my head. WOW! Thank you. Sharing this with my team at the morning briefing. Thank you for the nugget. Like the others have said, this is a great power-packed post. Several times I thought, yup- been there, yup- that’s me. But problems must be faced. When facing a problem, a positive mental attitude is a must. Usually is much better not to focus on the solution instead of the problem. Nevertheless, when facing difficult problems, understating the problem is a necessity as long as it helps to find the solution, In this case, we probably should spend 55 minutes on defining the problem, so we’ll spend 5 minutes articulating the solution (just like A. Einstein said). Something I use to think about, is that,”help others with problems, however don’t control other´s problems since others need to be different from you (me, we). Let them be different, so they can stand out from themselves not from yourself (myself, ourself)”. Thanks for your always great insight.